I’m superstitious. It goes hand in hand with believing in magical things which is why I write the kind of books I do. So when Chinese New Year Day comes around, or Spring Festival as it is called in China, I follow some of the traditions. I’m selective though. I follow only the ones that gel with me and are easy to do. The Chinese calendar is a lunar one so this year, Chinese New Year falls on February 8th. Here are the Do’s and Don’ts I stick to. 1.Clean, sweep or dust on Chinese New Year’s day otherwise you will sweep away all your good luck for the incoming year. 2.Don’t lend money on New Year’s Day otherwise you’ll be lending money for the rest of the year. 3.Don’t swear or say negative things or mention death or ghosts. Everything you say should be directed towards a new and happy beginning. 4.Don’t wash your hair on New Year’s Day or else you will wash away your luck. 5.Don’t cry on New Year’s Day otherwise you will cry for the whole year. For this reason children are tolerated even when they’re naughty. Sorry mums and dads of young children. 1.Wear something new, preferably red. Red is a bright happy colour so it welcomes in a bright, happy and prosperous year. I usually wear something that has red in the pattern. 2.Give children and unmarried friends ‘hong bao’ little red packets of money. It should be a nice crisp note. My children love this time of year. 3.Say something nice to the first person you meet. I like this custom. It should be a rule for everyday of the year. 4.If you hear birdsong on New Year’s Day, you are in luck. Living in Australia, where we have so many birds, this is an easy one. 5.And lastly, if it’s your year, wear red everyday until the year ends. This is not as hard as it sounds. When it was my year I wore a red silk thread around my wrist. Some people sew a red thread in their underwear. 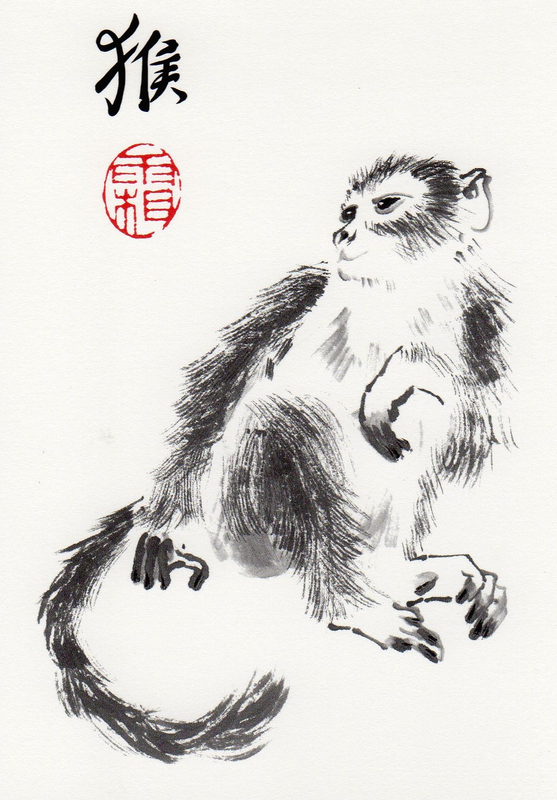 The Monkey in the picture above is ink on Chinese watercolour paper. The character on the right is ‘hou’ meaning monkey. The red stamp is one of my Chinese names ‘shuang’ which means frost. My full Chinese name is Wang Xing shuang which means ‘Wang Happy Frost’. Chinese always put family names first. Those born under this sign are intelligent, clear-sighted, ambitious, rational and gifted. All doors are open to them as they will be successful in anything they do. They are lucky, generous, chivalrous and sociable and often show a gift for languages. They make excellent parents. 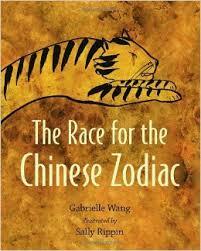 The Race for the Chinese Zodiac published by Black Dog Books in Australia, Walker Books in the UK, Candlewick in the US and Hubei Children’s Press in China is available through your local bookstore or online retailer. It’s a retelling of the traditional tale of how the animals on the Chinese zodiac were chosen and beautifully illustrated by my dear friend, Sally Rippin. Happy Year of the Monkey to you all! May it bring good health, happiness, a lot of creativity and new beginnings. And, of course, a little bit of magic! Excellent Gabrielle. Me too, superstitious that is! Can’t tell you how many times Miss 10 and I have been pouring over your book (above). It’s a(nother) annual tradition now. 🙂 Gong Xi Fa Cai! to you and yours as well.